In honor of the release of Tech N9ne’s All 6’s And 7’s, Strange Music celebrated in style with a rooftop pool party in downtown Kansas City. All of the Strange Music artists were on hand for the exciting event, including Watts’ own Jay Rock. 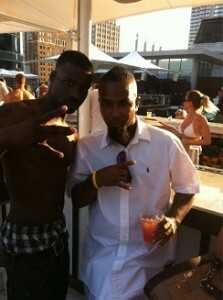 Tweeting live from poolside, Jay shared this photo of himself and Tech N9ne enjoying the festivities. The drinks were flowing, and the energy could be felt all over as everyone came together to celebrate All 6’s And 7’s. With Follow Me Home dropping on July 26, Jay had his own reason to be celebrating.